Your sightseeing trip to the big city is stopped short when you lose all of your money and belongings! 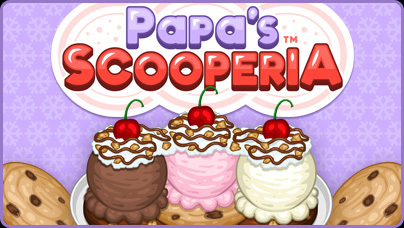 Stuck in Oniontown without the money to return home, Papa Louie has a unique solution to your problem: Stay and run his brand-new ice cream shop! You'll be baking up fresh, gooey cookies for each sundae, then topping them with hand-scooped ice cream in a variety of flavors. Add some sweet syrups and drizzles, pour on decorative shakers and candies, and finish the scoops with toppings before serving the mouth-watering sundaes to your hungry customers. Your customers will start by ordering sundaes with just one cookie and one scoop of ice cream, but as you keep serving them fantastic sundaes, they'll level up and start asking for even larger orders! Watch the sundaes grow and evolve as customers order two-scoop and giant three-scoop platters, with different cookies and different flavors of ice cream on top. Some customers like picky Closers will even start out with larger sundaes.